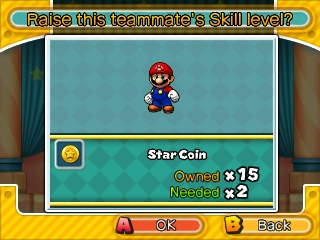 In Puzzle & Dragons: Super Mario Bros. Edition, players can increase their characters' Skill levels in the Skill Up spot at Toad Houses using Skill Items that can be obtained by opening ? Blocks, defeating enemies with 10 combos or more, or winning them from the Lucky ? Blocks spot. All characters' Skills start at level 1 and can be increased one level at a time until they reach the maximum level, level 7. Increasing a character's Skill level requires a certain amount of Skill Items which increase as their levels go up, and require rarer, "Grand" or "Rare" variants of Skill Items for later levels. Increasing a character's skill level by one reduces the required wait time for a character to use their Skill by one turn. No. : The character's number as listed in the Guide in the game's menu. Skill Name: The name of the character's Skill. Skill Turns: The default amount of turns the player has to wait until a character's Skill is activated. Skill Description: The Skill's in-game description. Level Requirements: The amount of Skill Items needed to increase a character's Skill level. Awoken Skills can also be upgraded by using Star Gems to increase their levels. Character(s): The characters that can use the Awoken Skill. Rolling over a characters card will display their name. Awoken Name: The name of the characters' Awoken Skill. Max Level: The maximum level an Awoken Skill can reach. Description: The Awoken Skill's in-game description. Level Requirements: The amount of Star Gems needed to increase the level of an Awoken Skill. Recovery Boost Lv.5 Increases HP healed by clearing Heart Orbs. Lv.1:? Bind Barrier Lv.4 Prevents paralysis if you're lucky. Lv.1:? Blind Barrier Lv.4 Avoids blind status if you're lucky. Lv.1:? Poison Barrier Lv.4 Avoids poison status if you're lucky. Lv.1:? This page was last edited on April 8, 2019, at 01:24.